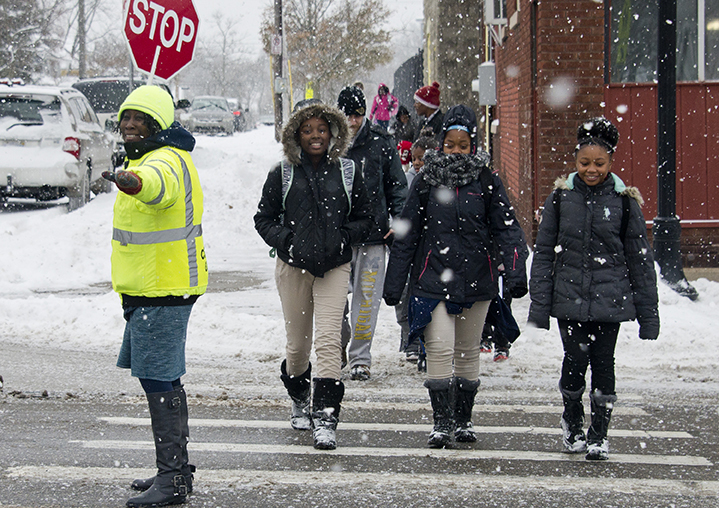 When Kattie Eason first stepped onto a Wealthy Street SE corner to serve as a school crossing guard at Henry Elementary School – now Martin Luther King Jr. Leadership Academy — she was 21 years old. Our president was Lyndon Baines Johnson. Gas cost 30-something cents a gallon. The minimum wage stood at $.140. A movie ticket went for $1.50. Kurt Cobain was born. And France was still using the guillotine to execute people. That was 50 years ago. And today, Kattie Eason, who turns 72 in March, still strolls from her home a few blocks to the school where she now is crossing the kids and grandkids — and even a few great-grandkids — of those she helped across the street back in 1967. 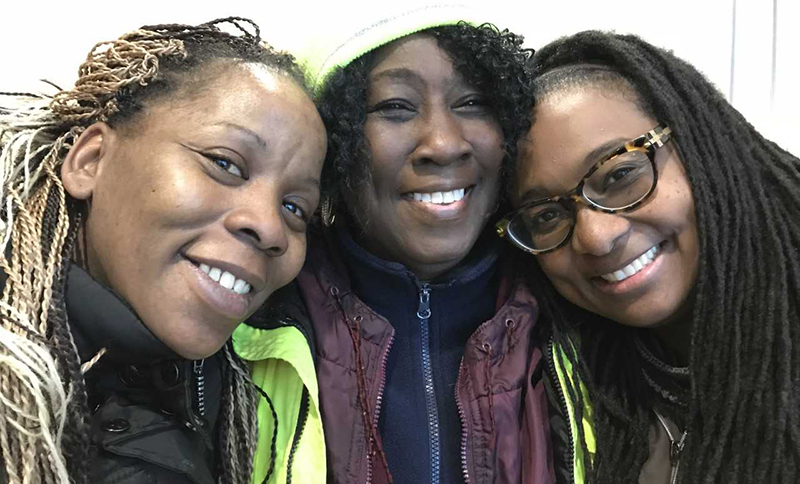 In that time, she has developed into so much more than a crossing guard, however, as a breathless Sheena Brown will attest: “She’s the principal, the assistant principal, the grammy, the cafeteria lady, the substitute teacher; she’s everything,” says this MLK special education instructor. Interjects a parent listening in on the testimonial: “We’re talkin’ about Ms. Beautiful right here,” says Aquenda Doyle. Others at MLK may wield more power or command more money, but you’d be hard-pressed to find someone more widely embraced than this woman who for five decades has been calmly standing sentry on behalf of those she calls “my babies,” in weather that fluctuates between well below freezing and far beyond torrid. Like little Jaxon Scranton, for instance, who at age 6 is a kindergartener at MLK and greets Eason each weekday after being escorted from his home to the corner by father, Patrick, who works nights. But it’s not like Eason to miss. When she does, Earth’s axis tilts a bit, and only re-aligns when she returns to the corner of Wealthy at Henry Avenue. When Jaxon turned a year older this past November, Eason surprised him with a Crayola art set. Patrick was surprised. But not entirely shocked: “The other day, Jaxon was the last one to arrive at the corner,” he says. “It was slippery, and he almost fell. Possibly arm in arm. Though you can’t exactly say so. In recent years, it’s become taboo to touch kids as a sign of affection. But 50 years of service gives you secret privileges. Eason moved from the deep South to Grand Rapids as a tot, the daughter of a construction worker and a mother who worked in a convalescent home. She graduated from Central High School here and attended Central Michigan University before marrying at 17 and having three boys and a girl. While stillliving with her three sisters and one brother, their father rose each workday at 4 a.m. and expected everyone else in the family to do similarly. It’s a habit that continues today, with Eason greeting the pre-dawn to sometimes take in a prayer service conducted by her brother, the Rev. Robert Dean –- a former GRPS board member and state representative who’s served more than 30 years as pastor at New Life Church of God in Christ. Then it’s off to the street corner on foot – Eason never learned to drive – to be in place by 7:30 a.m., far ahead of the arrival of her first charge. 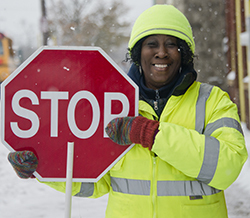 She’ll wave to beeping motorists in between heralding kids across an intersection that is marked by a school crossing sign but boasts no light. 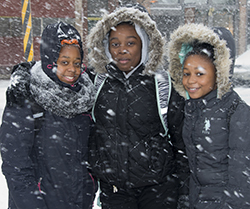 “We feel safe and protected,” says Sharkia Caldwell, an eighth-grader. “And she’s really nice,” adds classmate Zaionna Love. Sometimes, just the sound of Eason’s voice can soothe. 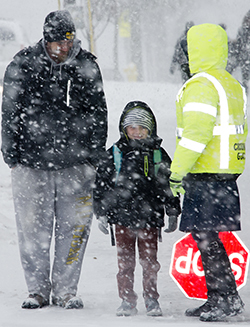 “It’s horrible,” fifth-grader Charlisa Garner opined of early morning weather one day earlier this month, as she braved wind-driven snow that flooded her eyeglasses with flakes. But Eason coaxed a smile from the corners of her shivering lips before walking Charlisa and her younger brother John, 9, across the street. 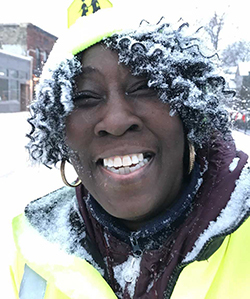 Eason made her first dollar babysitting, then tried her hand at factory work before signing on as a paraprofessional with the Grand Rapids Public Schools, a job she performed at Henry-turned-MLK for some 32 years. 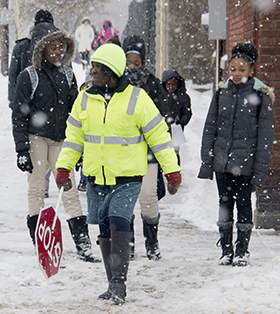 She’s formally retired from that role, and earns a paycheck now only for her time as a crossing guard for MLK’s students, which number nearly 400. She often enters the school each day even before assuming her post — to brew the first pot of coffee, help set up breakfast fare — and then sticks around between the first and last school bells to pitch in wherever there’s need. 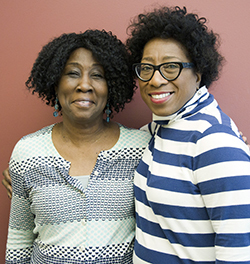 When at the address on Prince Street SE that Eason shares with husband Marcus, the couple operates an adult foster care home, something they’ve done for 20 years, and what qualifies as Marcus’ full-time job. 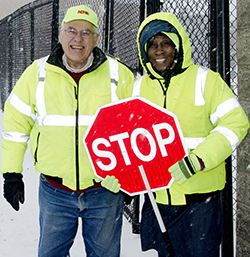 Eason figures she’ll continue on as a crossing guard as long as her health holds steady. “I don’t think I’d be able to sit at home.” She’s very involved with not only her own church, but several others where she helps direct women’s activities. Given a work ethic forged at the knee of both mother and father, Eason hasn’t missed many schooldays. Most of her absences were tied to arranging medical appointments and such. When she suffered a spell with some sciatica issues, she was issued a cane. And just took it with her to her post. For Eason, it’s not a job, but an opportunity to serve. No child will ever cross her corner twice without a warm coat and boots and mittens and a cap –- expenses for which she is not reimbursed. If it’s raining, she’ll give some kid the umbrella she’d been using, and goes without.